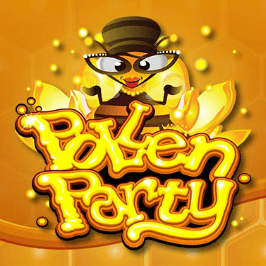 If you thought all that bees did was work, work, work then Microgaming’s Pollen Party slot may well give you a bit of a buzz. This five-reel, 720-payline offering features party-loving bees who like nothing more than letting their hair (antennae) down and getting their sting on after a hard day’s droning. Play Pollen Party for Real Money! From a visual standpoint, it’s fair to say the Pollen Party 3D video slot looks rather like a game that’s been passed on by Nintendo. The cartoon-style graphics are bright and bold, with an unsophisticated yet fun air about them. The background, all rolling green fields dotted with beehives and clear blue skies, is reminiscent of a landscape that Mario and Luigi would enjoy exploring too. That being said, the reel area is pretty cool as it’s been designed to resemble a honeycomb-type structure. This means that reels one and five are three symbols high, reels two and four are four symbols high while reel three is five symbols high. 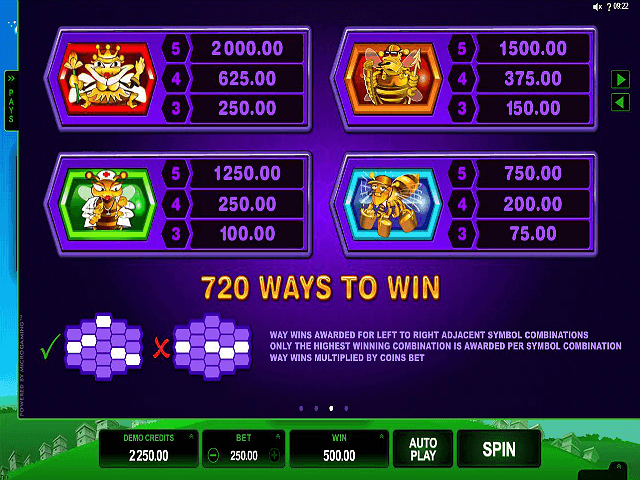 This isn’t something you see every day in the slots world and it’s great that there are 720 ways to win from it. Other plus points include a nice high RTP of 97.00% and the addition of not one but two bonus features. The fact it can be played from 50p to £250 per spin is also pretty sweet. 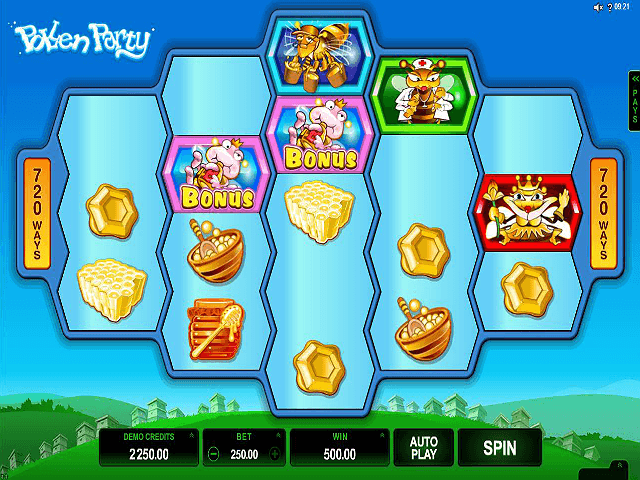 The choice of symbols used within the Pollen Party online slot game perpetuates the hive theme. A selection of honey pots, sugar bowls, jellies and honeycombs make up the lower value icons and a quartet of cartoon bee characters (queen bee, worker bee, warrior bee and medical bee) round out the higher value symbols. Naturally, the queen bee is the top payer. The game also has a standard wild that replaces everything except the straightforward scatter and bonus symbols. 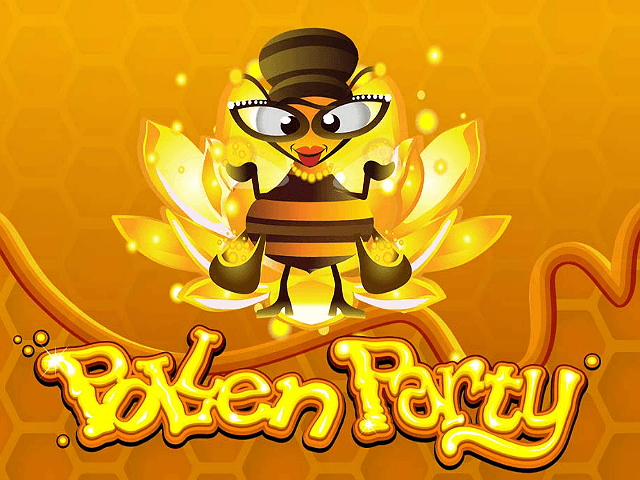 The first of the Pollen Party slot game’s two bonus features is a free spins round. 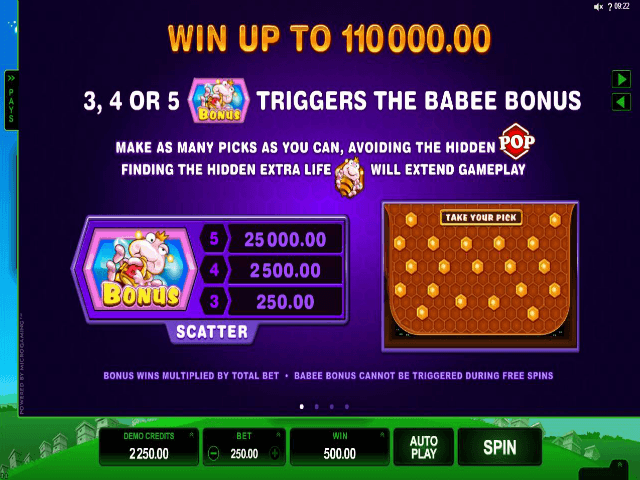 To trigger this you simply need to land three or more scatter symbols anywhere in view and you’ll get 12 free spins. If you manage to land the bonus symbol on reel three during this round then up to three additional wilds will find their way onto the reels. The second bonus feature, Babee Bonus, is activated by landing three or more of the baby bee bonus symbols anywhere in view. Do this and you’ll go to a separate screen showing 20 honeycombs. 17 of them contain cash prizes; the other three are pop symbols which cancel the feature and send you back to the main game. Your job here is merely to choose wisely. It’s fair to say Pollen Party isn’t a groundbreaking slot game by any measure. Indeed, the graphics and overall presentation actually give the game a somewhat dated feel. However, it’s a fun and upbeat title and the RTP of 97.00% is enough in itself to warrant a prolonged fly-by at least. Share this Pollen Party Review today! If you like Pollen Party, you'll love these slot titles too!